Boliden Tara Mines has announced its €44m plan to further develop the Tara mine near Navan, Co Meath. 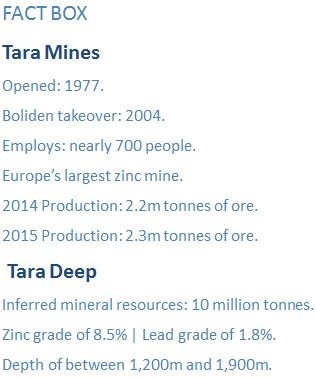 The ‘Tara Deep’ development, which will make Tara one of the world’s deepest mines, will enable production until at least 2023 though the new tailings dam expects to be fit-for-purpose until 2026. The zinc ore deposits reach nearly 2km in depth and the construction of an exploration drift to the deposit is expected to cost €11m while €33m will be invested in the new tailings dam. Mikael Staffas, president of Boliden, said: “Tara’s exploration work in the last few years has been successful, and the capacity of the tailings dam is now limiting the life of mine to 2020. New exploration successes, increased productivity, and high zinc prices make extending the mine’s lifespan a profitable option, so we have decided to expand the tailings dam with a capacity until 2026”. The Irish Times reported that Tara Mines Holdings and subsidiaries showed a decline in turnover by 17.3% in 2015 to €155.3 million from €187.8 million a year earlier. The company also reported a €65,000 pretax loss, versus a €6.2 million profit a year earlier. A return to profitability is expected for 2016. A number of Geoscience Ireland Member Companies have worked on Tara since its opening in 1977; last October, QME won contract-mining works creating over 80 jobs.